Here are “John Brinson”‘s recollections of that first season from his emails earlier this year. He obviously has better recollection than the rest of us. It probably seems like ancient history now. A great experience. We were all there on that final drive of 45 yards, running on every play, 4 yards, 5 yards, 4 yards until we got to the goal line, and “Ralph Wensinger” took it over behind Brad and the rest of us. They couldn’t stop us. There were 600 at the screening in May; 150 made it to the tryouts in September; Coach “Eric Tipton” had 2 weeks to cut the squad to 48, teach plays, and play our first game. All 6 of us made the starting team. Center, LG, LT, LE, QB, RB. Brad was elected team captain, and a good one he was. QB “Ralph Wensinger” (’59 x ’58) KIA, RVN Ralph was ’58 for 3 years. We were all starters – first team. 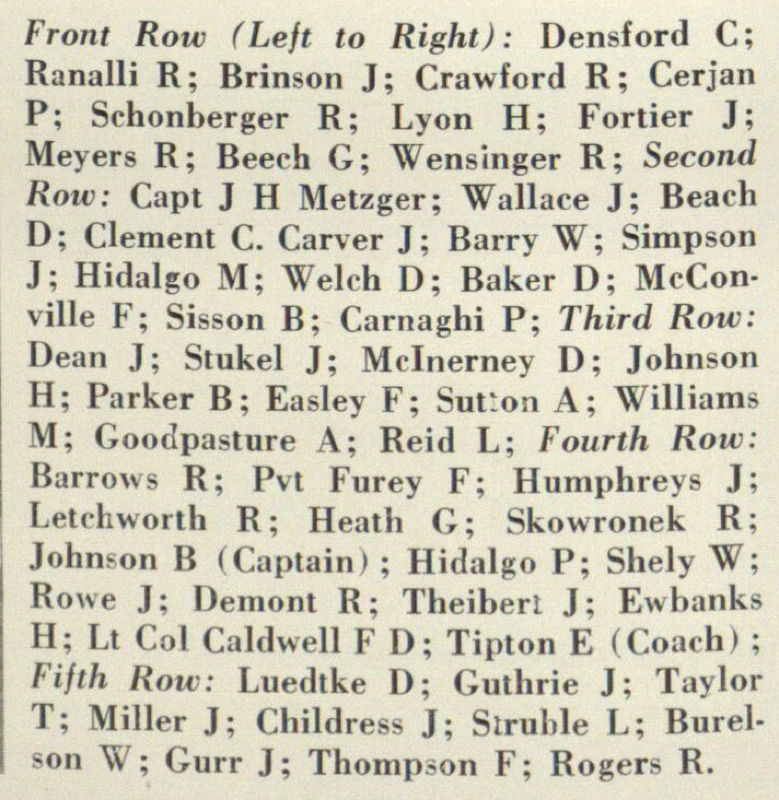 It was not easy making the starting team, because the coach rightfully preferred Yearlings, then Cows, who would return next season. 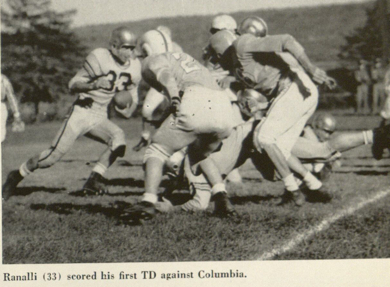 We played both offense and defense – under the then-current NCAA rules. 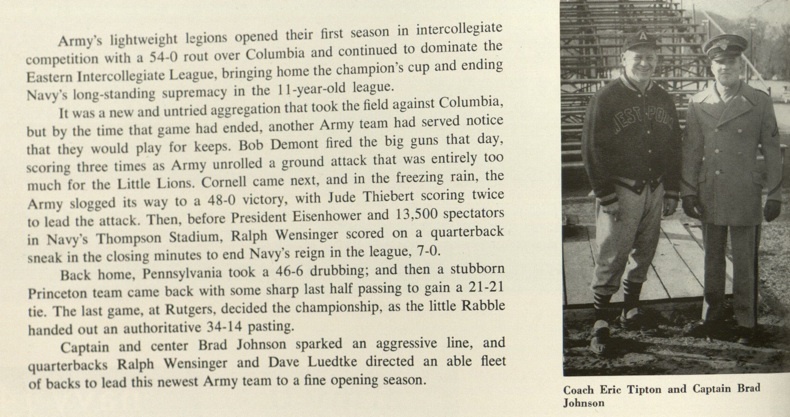 We were undefeated, beat Navy, and won the (EIAA) Eastern Intercollegiate Athletic Association Championship in Army’s first year – in a league that had been dominated by Navy for years. It was great fun. President Eisenhower attended one of our games. 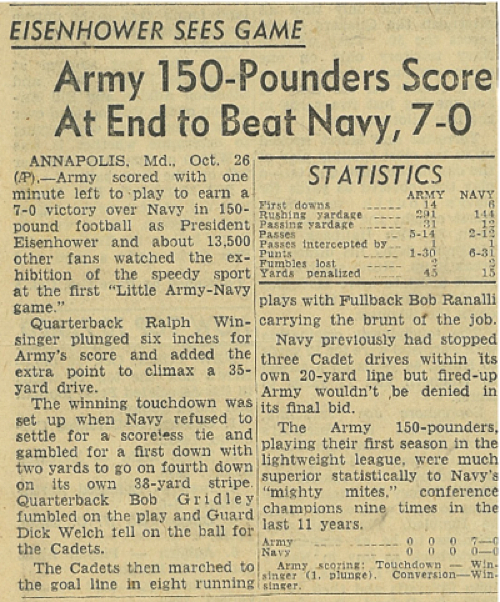 (Note:) My recollection is two games that year, one when the President was visiting WP and came down on a Friday evening and the other was the first 150# A/N game at Annapolis Our great coach, “Eric Tipton”, went on to become the all-time winningest coach in Army history (lightweight football, baseball). 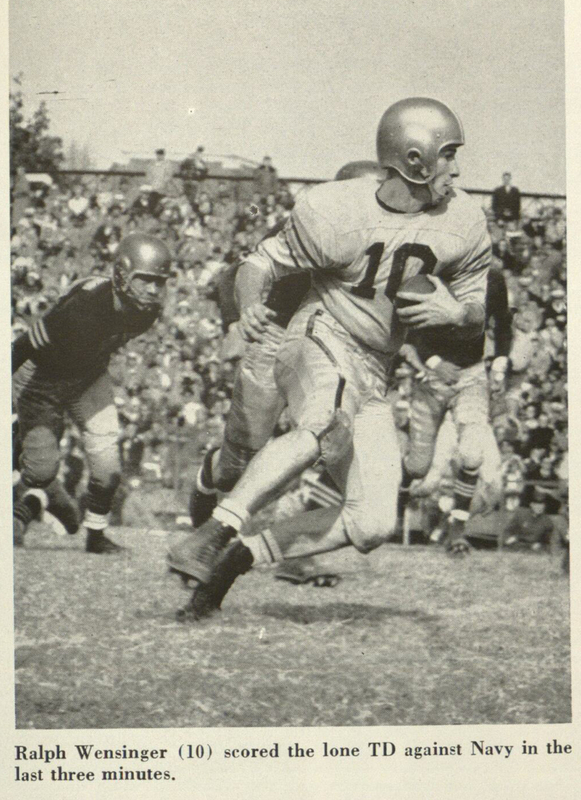 Eric was All-America at Duke in 1938, and was inducted into the College Football Hall of Fame in 1965. We all loved him, and honored him at a 150 lb. reunion at West Point in 1993 when he was 78 years old. He died at age 86. This entry was written by forwhattheygave, posted on July 7, 2008 at 5:38 pm, filed under Teams and tagged 150, Sprint Football. Bookmark the permalink. Follow any comments here with the RSS feed for this post. Trackbacks are closed, but you can post a comment. Have heard about this game more than 50 years. Ralph Wensinger was my cousin. This is the best account of this great old football game I’ve seen… and by far. Wish there were 150 pound teams at every college. 600 cadets tried out for this team! Amazing. So many talented athletes in that weight range at every school. Many thanks for putting this page together. I’ll send the link to friends and family members. Do you have any material to add to the urgent posting? Thank you for making these great articles available. Ralph Wensinger was also my cousin and I will also share the link!